One of the many brilliant things about sewing is that when you see a garment you love, you can make your own version. And that's exactly what I did with this dress! The inspiration was a gorgeous Anna Sui dress I spotted on the interwebs a while ago. 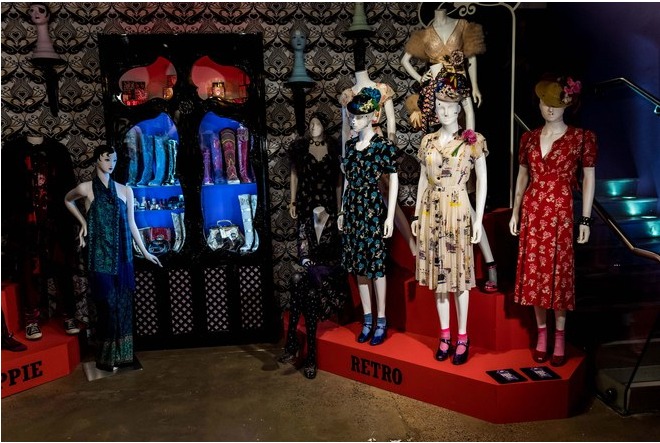 I had seen some posts about an Anna Sui exhibition in London last year, and the red dress on the far right was definately popular. I love the 1940s-ness of it, so decided to draft my own version. There are some close-up photos in this post and this post. 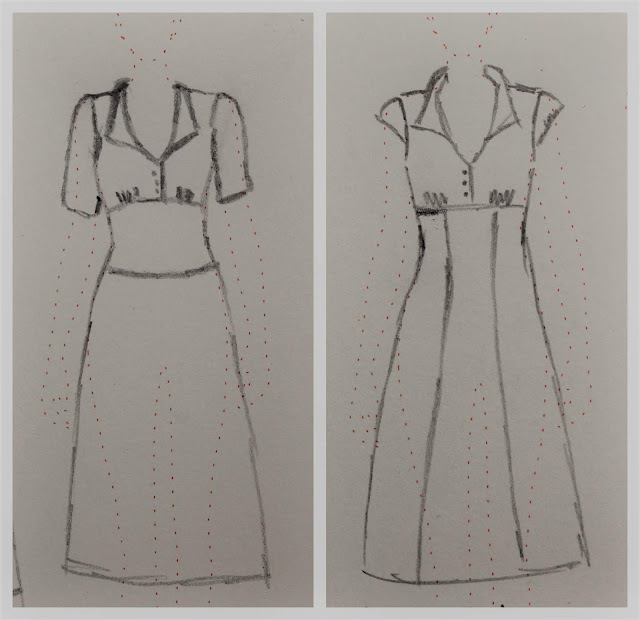 The dress has a shawl collar, button front to the waist and flared skirt. It looks like the original has a midriff yoke cut on the bias, but I can't work out how to draft that! If anybody knows of any resources, please let me know. Instead, I made the skirt and midriff section in one piece using princess seams. I scribbled some ideas in my Fashionary note book - how I think the original looks is on the left, and what I made is on the right. The bust is shaped with gathers, and I raised the neckline a bit for reasons of modesty! Then I made some fabric covered buttons. The collar is drafted using the Partial Roll Collar from the Craftsy "Pattern Making And Design: Collars And Closures" class. The bodice back is shaped with darts. I didn't have enough fabric to make similar sleeves, so I made these little capped sleeves with a bit of elastic in the cuff. They were a faff to sew, but I love how they turned out. Talking of fabric, this is some gorgeous viscose from the good old Textile Centre, and it was £3.99 a metre. I stablised it with some spray starch, which got washed out once the dress was finished. I am absolutely delighted with how this turned out, and it is definately one of those "this is my new favourite make" makes. I'm already planning another verison using this gorgeous Lady McElroy crepe called "Chaffinch Bough". And, it's number seven in my 2018 Make Nine! This is absolutely gorgeous, I love your pattern drafting skills! And love the 1940s vibe. I recently found an old magazine with pattern drawings (but none of the actual patterns sadly!) from 1940s and some of them have that midriff yoke style. 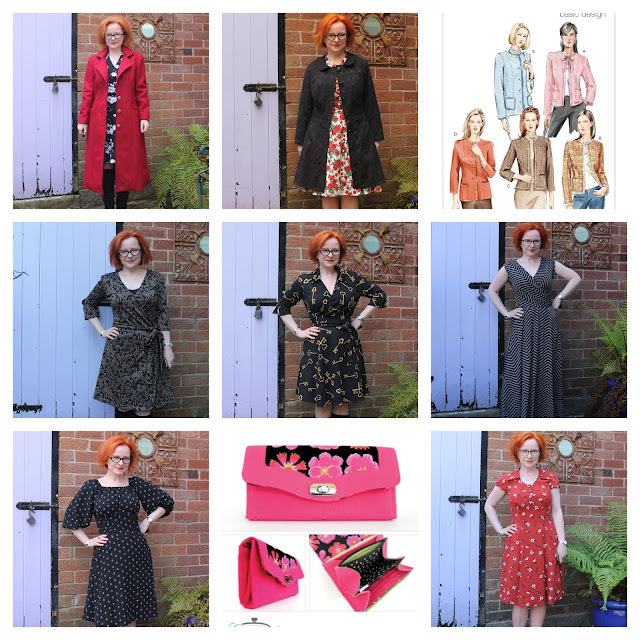 There are a few of the patterns that I'm determined to draft if I can just work out how some of those pieces were drafted! Hi Emily, thank you very much for your lovely comments! What a find with the magazine! I love looking at old dresses for inspiration, and this yoke style seemed to be very popular then. Please let me know if you work out how to draft it - thanks! This is so pretty and the colour and style really suit you �� I’m still at the point where I have to hack patterns together to get the overall design I want but love the idea of learning to draft in the future. Really want to try using bust gathers too - just realised that the RTW dress I’m wearing has them. Thanks Caroline! The Craftsy pattern drafting classes are brilliant, and I've learnt so much from them. And bust gathers are great - no faffing around with sewing darts!! You never disappoint. Be proud. Thanks Colette! I'm looking forward to seeing the chaffinch fabric, I've been hoarding it for a while! You are such an amazing dressmaker Lynne. I am in awe of your beautiful creations! It’s a cracker! I love that you drafted this so well yourself too! Thanks Sarah! I'd forgotten how much I like drafting until I did this. Lovely dress Lynne! I'm always so impressed by your recreations of dresses that have inspired you! I love your makes, but don't usually comment - but this is superb!